Pakistan Passport Holders can Travel 33 Countries around the World Including Visa on Arrival and Visa Free Countries for Pakistani nationals. Indian Passport Holders Travel to 61 Countries Visa on Arrival and Visa Free Countries and EVISA Online from Indian. Trinidad and Tobago Beautiful Country and Every Year Traveller Visit Trinidad and Tobago to spend time with family and enjoy the weather and beautiful beaches and beautiful natural places. Trinidad and Tobago Beautiful Caribbean Sea and near to Venezuela with nice tradition. Trinidad and Tobago Offer Settlement Programs in the different part of the world.You Can Get easily Settlement in Trinidad and Tobago.Trinidad and Tobago Population 1.369 Millions. You can Get Ticket from Pakistan Easily But Before doing anything You must Need to understand some important Routes and Layovers and Stops as well. You Can Make Booking from Brazil..If booking not available from Brazil than you don,t live your country for Trinidad and Tobago because Visa Offer and Immigration Officer will not allow to travel this Country and he will definitely deport you from any airport around the world. 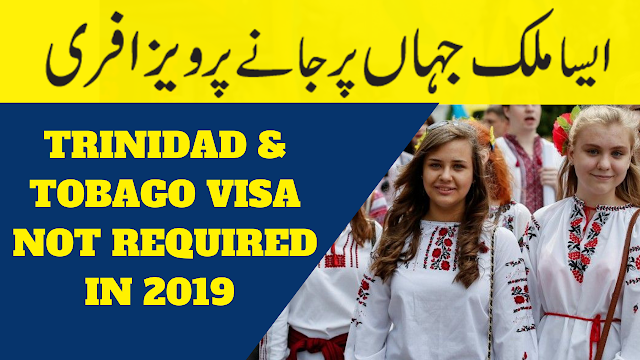 You Must Need Transit Visa if you are going to Travel through (Eu area) Europe and UK and USA and other countries including in this list.